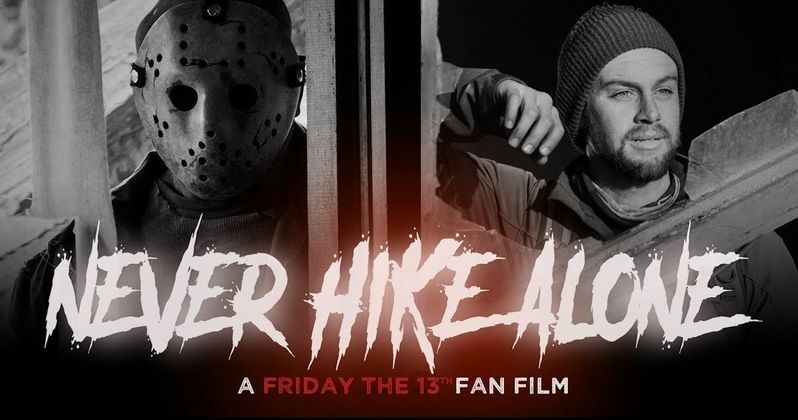 If you want to own the popular Friday the 13th fan film Never Hike Alone on Blu-ray and missed your opportunity before, a second Indiegogo campaign is giving you another chance. The studio behind the movie, Womp Stomp Films, has launched a Second Edition Never Hike Alone Blu-ray campaign which is now live. This will not be a DVD combo pack, only including a Blu-ray disc and digital rewards. Bonus features on the Blu-ray will include theatrical 5.1 surround sound, behind the scenes documentary, audio commentary, subtitles, trailers, and an exclusive case with new artwork. Aiming for a $13,000 goal, funding raised from the campaign will go directly towards printing the physical media, along with packaging and shipping costs. Leftover funds will then be used to produce the filmmakers' next project, Pathosis, and if the campaign reaches $30,000, an additional "Secret Project" will also be developed. Womp Stomp Films is launching this second home video campaign to appease Friday the 13th fans late to the Never Hike Alone party, feeling left out over missing their chance to purchase a copy of the movie. "Since the completion of our previous campaign, our e-mail and social media message inboxes have been flooded with requests for copies of Never Hike Alone," says director Vincente DiSanti. "Unfortunately, we have been forced to turn away a lot of enthusiastic fans who discovered the film after the original campaign was long over. Our focus has always been to answer fan demands within a reasonable expectation. We certainly wouldn't be pursuing this unless demand was overwhelming." It's crowdfunding campaigns like this which help keep Jason Voorhees alive until another "official" Friday the 13th movie can be made. Never Hike Alone was fully funded by franchise fans, leading to the creation of one of the most well-made fan films ever. Those hoping to own a copy for themselves were given a chance to do so when the first Blu-ray campaign was launched, which was also highly successful. The movie may not have been made by a Hollywood studio, but there are still many fans of the series considering it to be an actual sequel to the actual Friday the 13th movies. Originally intended to be a found footage movie, Never Hike Alone follows lone hiker Kyle (Andrew Leighty) on his path through the woods with his trusty camcorder. After he stumbles upon the abandoned campgrounds of Camp Crystal Lake, Kyle finds leftover remnants and mementos from Jason's multiple killing sprees. Entering Jason's turf also brings back the horror icon himself, leaving Kyle to fight for his life against the masked maniac. The movie is linked to the Friday the 13th series by bringing back one of its most popular characters, with the actor who plays him reprising the role. We won't mention exactly who that is here for those who have yet to watch, but fans of the franchise will be ecstatic.